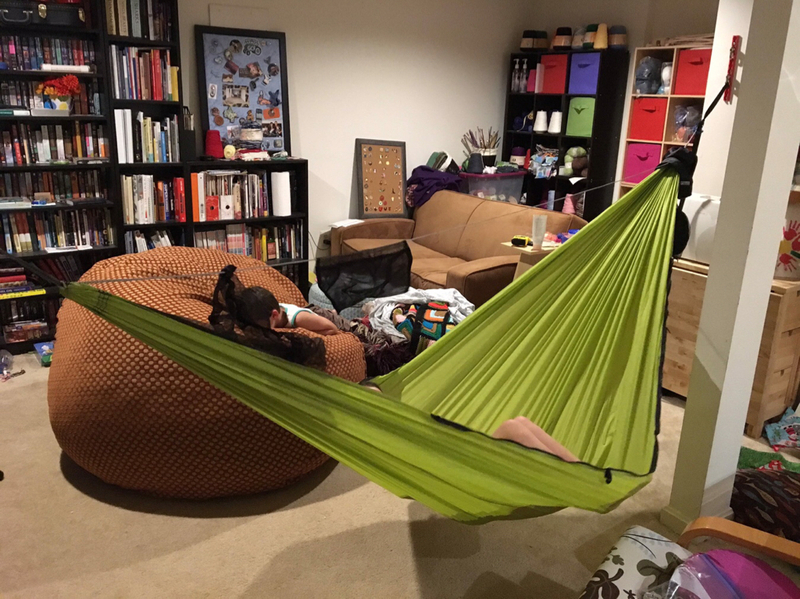 I do not know if it is an existing thread, but to copy the steveE's thread I'm asking to you guys and girls about your indoors hang spot. I live in apartment and have no backyard, so I have a room to hang and test my new hammocks. I like to have an indoor hang anchors so I can use my hammocks before to go outside, although I couldn't test the efficiency of the under or topquilt as the room is climatized. Mine is 14' apart from anchor to anchor. I'm using Dutchware wall anchors which is really nice! To install them I used the hammock calculator. Here is my room using an Exped scout hammock, I do like it! I’ll bet those wall anchors are perfect for your apartment! I do all of my testing and tweaking in my basement with a pipe stand. It is also my go to bedroom for when the grandkids come over (since they always want to sleep in bed with grandma). I have a second pipe stand that I keep in the backyard, so many times I’ll go out to the yard, set up my tarp, throw a set of straps on the stand, then just unclip my hammock from the basement stand, with quilts & UQP attached, carry it outside, and just hang the continuous loops onto the beetle buckles/straps. Only takes a minute! "If somebody tells you there's a rule, break it. That's the only thing that moves things forward." 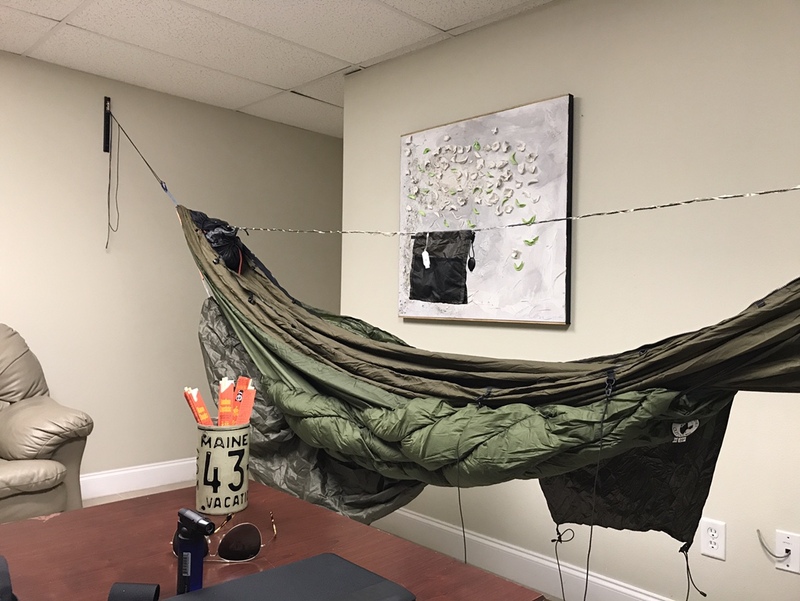 I set up a hammock hanging rig in my office. The walls are 16' apart, and I screwed in a length of black L-track on each wall with some D-ring fittings. I have a whoopie sling on the foot end for length adjustment, and each end is about 1' height-adjustable. For my Chameleon, I put the foot end 1' higher and it's perfect. My desk makes a great night (day?) stand. The hammock in my bedroom. It's hung with L-tracks, the far one is just behind the curtains, the near one is behind the door when it's open. I think it's about a 12' span, could be more. The underquilt is something I kludged together from a Macy's down throw blanket (bought on sale.) The judgy cat is Tony, named for Tony Stark. I haven't yet delved into the indoor hammock thing. 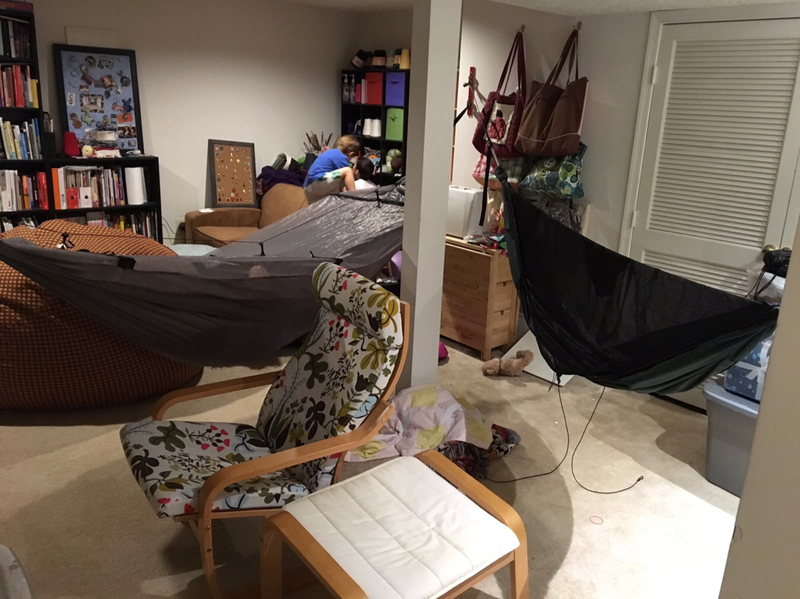 In our basement I have three L-tracks arranged in a triangle to hang two hammocks. Can’t get a third due to a pillar you can’t see in the pics. In our basement I have three L-tracks arranged in a triangle to hang two hammocks. Wow, you've got some faith in your hardware!! One my head end, I have an L-track with 3" tapcon screws going through drywall and into an exterior block wall. On my foot end, however, the track is fastened to a stud in a wall that I think was added long after the building was erected. It creaks and whines every time I ease into my hammock...! And while I'm confident it would hold my wife and I, the typical arrangement thus far has been me and one kid. I really set them up to help acclimate the kids to hammocks before we went hammock camping last fall (big success). For me, I've mostly used it for occasional lounging in the evening and playing with my underquilt setup.